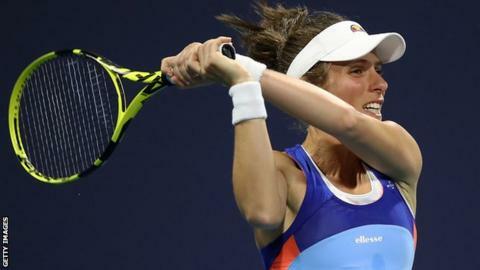 British number one Johanna Konta lost 10 games in a row as she was beaten by China's Wang Qiang in the Miami Open second round. Konta, ranked 38 in the world, lost 6-4 6-0 to 18th seed Wang. Wang raced to victory after overturning Konta's 4-2 first-set lead, with the Briton converting just one of 11 break points. Qiang will face Serena Williams next after the 23-time Grand Slam champion beat Rebecca Peterson 6-3 1-6 6-1. Tenth seed Williams hit nine aces as she overcame the Swede. Earlier, world number one Naomi Osaka beat Yanina Wickmayer in three sets to reach the third round. Japanese Osaka, who had a first-round bye, beat the 141st-ranked Belgian qualifier 6-0 6-7 (3-7) 6-1. "In the second set I got really emotional, so in the third I just tried to shut off my feelings," Osaka, who hit 14 aces, said. "I started thinking about winning and not the things I could do in order to win. I had a dip and she started playing really well. "I had to breathe and regroup. I find myself doing it often when I am in emotional situations." Defending champion Sloane Stephens began her title defence with a 6-2 6-3 win over Ons Jabeur. Australian world number 40 Ajla Tomljanovic beat Belarusian ninth seed Aryna Sabalenka 6-3 6-4. Indian Wells champion Bianca Andreescu continued her good form with a straight-set win over American Sofia Kenin. Canada's Andreescu, who had to save match point in her opening-round match against Irina-Camelia Begu, beat Kenin 6-3 6-3. Andreescu will face Angelique Kerber next in a rematch of the Indian Wells final after the German beat qualifier Karolina Muchova 3-6 6-3 6-3. Caroline Wozniacki claimed her first WTA win since 16 January with a 6-4 6-4 victory over Aliaksandra Sasnovich of Belarus. The Dane will face Monica Niculescu next after the Romanian beat former world number one Garbine Muguruza 7-6 (7-0) 4-6 6-2. Serena Williams and Simona Halep begin their Miami Open campaigns later on Friday.